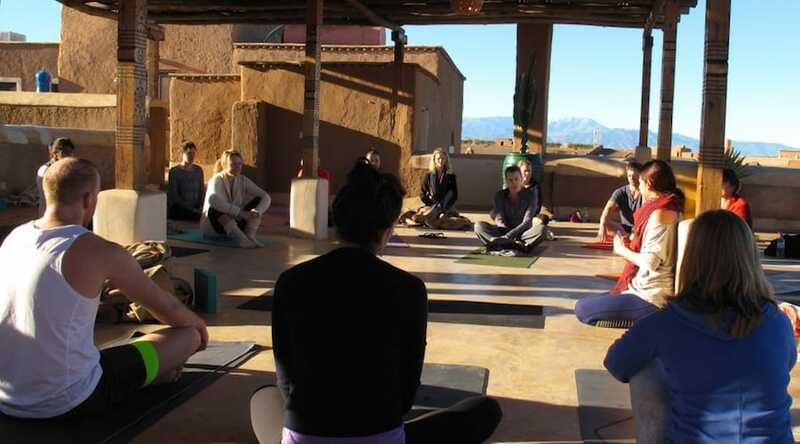 Yoga Explorers run relaxed group yoga holidays four times a year at Hotel Tigmi, a peaceful place with a simple spa and hammam set on the edge of a rural Berber village around a 30 minute drive from the centre of Marrakech. You might see a goat herder passing in the morning and hear the call to worship from the mosque at dusk – and whilst the hotel is large enough for a group of up 24 guests, you’ll always be able to find a quiet spot. There are two classes a day led by trusted yoga teachers on a rooftop terrace or in a naturally light room, and meals are graciously served on an open air terrace. The rest of the holiday is up to you: there’s a hammam, extra excursions, walks from the hotel, or chill time by the pool for a boost of Vitamin D.
The peaceful venue and its two glorious swimming pools – go for a gossip at one or pull your hat down and snooze at the other. 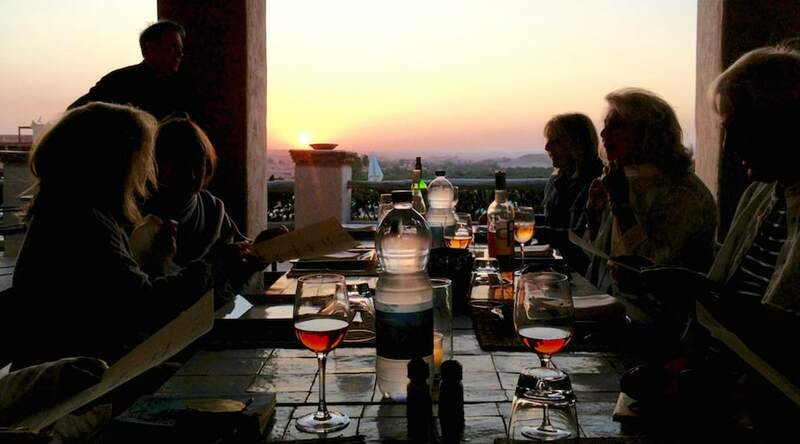 This is a popular holiday and the group can be up to 24 guests – with that comes lively rather than quiet mealtimes and a sometimes crowded yoga space. Your holiday will revolve around two yoga classes a day, except Wednesday which is a free day. The rest of the time is up to you – indulge in pure rest and relaxation between your room, the pool and the hammam or set out to explore Marrakesh, the Atlas Mountains or neighbouring villages and places of interest. The twice-daily two hour classes vary according to the teacher. They usually feature a more dynamic practice in the morning and a more restorative session in the late afternoon. Depending on the teacher, there might be sessions on specific areas of the body or selection of postures, or perhaps purely on breath work or yogic philosophy. Classes may be done to music and involve props (bricks, bolsters, straps are all provided). Teachers are hand-picked by co-founders Jo Thornhill and Jim Tarran. Jim also teaches at Hotel Tigmi once a year (as well as on other retreats), and for the rest of the year runs Vajrasati Yoga school in Brighton and London, in which he teaches regular classes and teacher trainings. Jim teaches with his partner and colleague Khadine Morcom at Tigmi, mixing hatha yoga postures with meditation and breathing techniques. Other teachers include Jonelle Lewis, who teaches a vibrant vinyasa flow class. Originally from Philadelphia but now living and teaching in London, she is great fun to be around and knowledgable about the postures and philosophy of the yoga. On other retreats, Sarah Williams teaches a slow vinyasa flow class, Beth Win offers an awareness-based vinyasa class and Lisa Jones specialises in somatic and restorative yoga. Talk to the company about which style would suit you best. Tigmi has its own hammam and a couple of treatment rooms tucked away in one of the central courtyards of the hotel – book treatments in advance at reception. A session in the hammam involves a silky wash down with Moroccan ‘black’ olive oil soap and ten minutes or so in a heated room. You can opt for one of a handful of experiences, all lasting around 30 minutes, with either a body mask or scrub down with a pretty firm hand gloved in a exfoliating mitt. It’s all worth it for a relaxing wallow in the warm water square bath at the end, and a rub down with a towel which is reminiscent of having your mum dry you off. Massages, facial, hand and feet treatments and sugar waxing can be booked as extras. 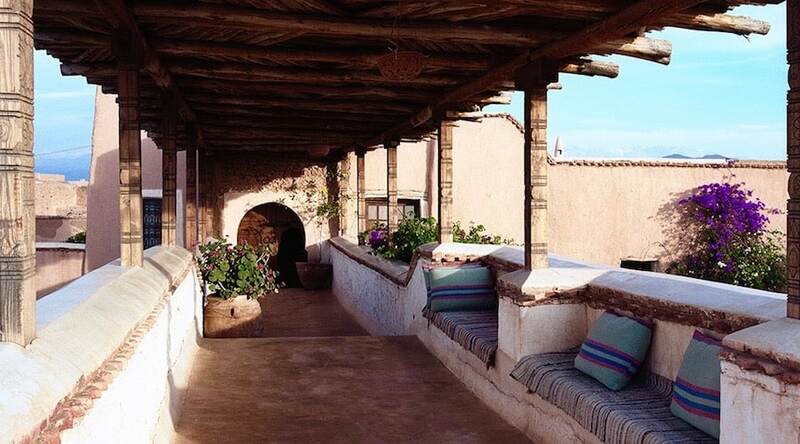 There is also the option to have a manicure, pedicure or a 100% natural facial, using a traditional Berber recipe of Rhassoul clay mined near the Atlas Mountains and locally harvested wheat and olive oil. You can choose to wrap it all up into a package with names like Berber Rituals, Moroccan Seduction or the Sultan’s Treat (for men!) which can be taken either over the course of three days or altogether on one divine day of pampering. Therapists here are well-trained and have a good touch, but not all of them speak English (or French), so check who’s available when you book. You’ll have plenty of time to do exactly as you please, whether it’s sunbathing and swimming or finding a nook in the shade for a read and a nap. 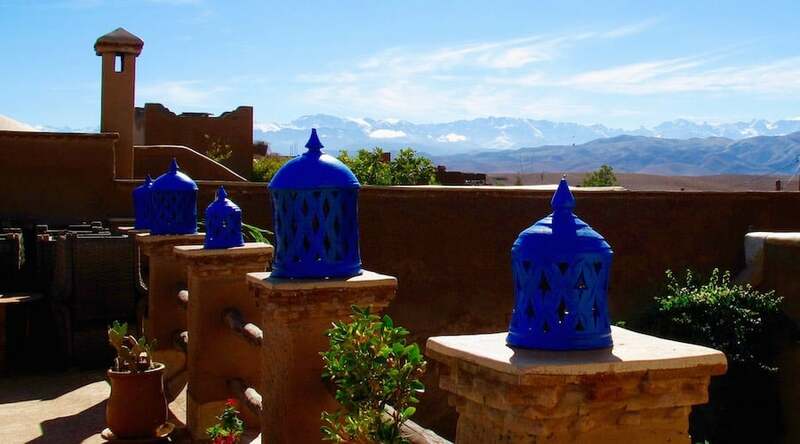 Or you can connect with your surrounds by taking a walk around the village, over to the nearest Kasbah, which is about 20 minutes away, or along the track that crosses the open plain behind the hotel, where you can drink in the view of the magnificent Atlas Mountains. Yves Saint Laurent garden because the artist saved it from being turned into a hotel by buying it in 1980. Berber rooms: Bedrooms are spread over both the old and new areas of the hotel which are separated by a small village road. Some are inter-connected, and others, in the oldest part of the hotel, open onto the smaller pool. 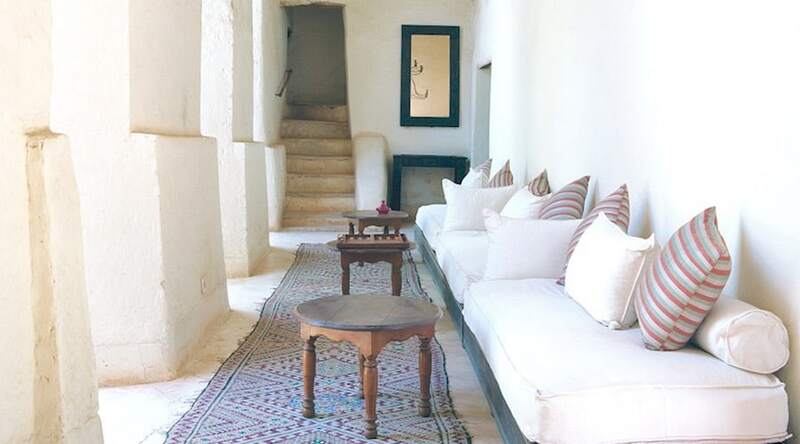 The rooms are light and airy with white limestone washed walls and high exposed beamed ceilings. Beds are comfy and well dressed with good quality cotton sheets and sumptuous bed throws and cushions in deep warm colours. 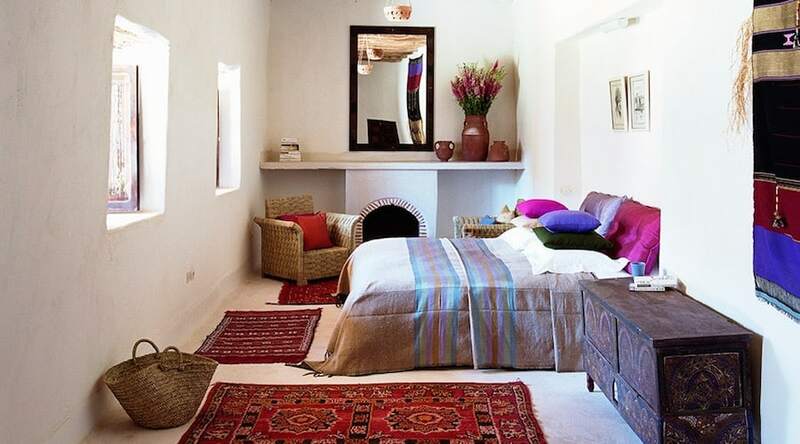 There is an open fire in either the bedroom or a separate sitting room, terracotta lamps and Moroccan rugs on the floor. All have bathrobes, a safe and hairdryer. The bedroom floor and entire bathroom are finished with creamy smooth tadelakt plaster. Bathrooms have traditional gold-plated taps and sink, a long mirror, walk-in shower with two different shower heads and a chair for throwing your kaftan over. Suites: Similar in style to the bedrooms, the suites are more like mini apartments and may be over one or two floors with either their own private courtyard or a terrace with loungers and comfy chairs. They also have air conditioning, and can fit extra beds. Depending on your room you might have a fireplace or terrace with chairs and loungers, and an asparagus-like chimney ‘growing’ up through it. Other spaces to be: You’ll always find a quiet spot to curl up in the shade or catch some sunshine because Tigmi is simply full of nooks and crannies. 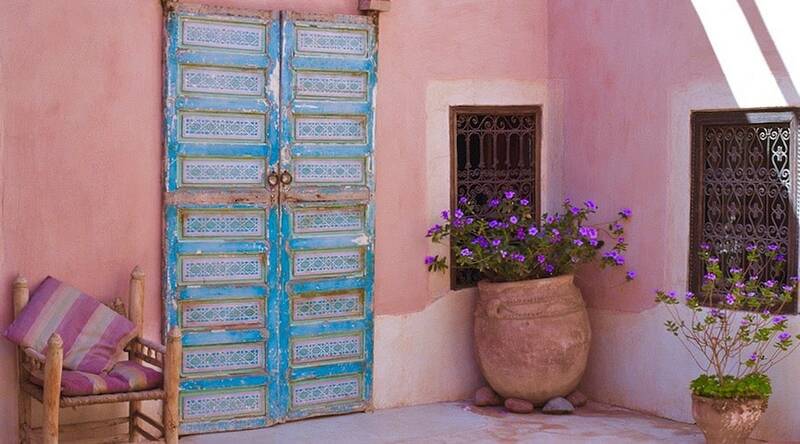 There are a couple of courtyards that have cacti, aloe vera, flowering bushes and walls of pink and bright orange bougainvillea, wide daybeds with neatly lined up red and purple cushions, and little areas with a table and chairs where you can be served mint tea. Then there are snugs with comfy couches and bookshelves, small roof terraces (just follow the tiny stairs and see where you end up) and of course the yoga deck to chill out on when everyone else is around the pools. Although there is shampoo, body wash and moisturiser in your room, take a travel size of your favourites in case they don’t suit your skin. Mats and accessories are provided, although you should take your mat if you’re not happy to practice on a used one. 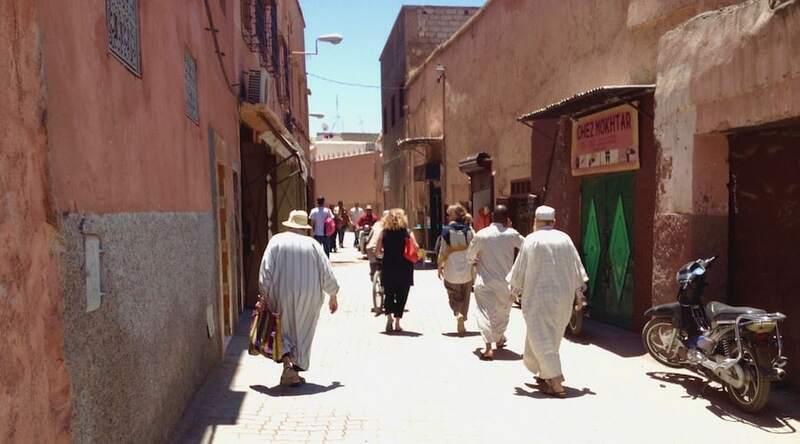 You can use either Dirhams or Euros as spending money at the hotel and in Marrakech. 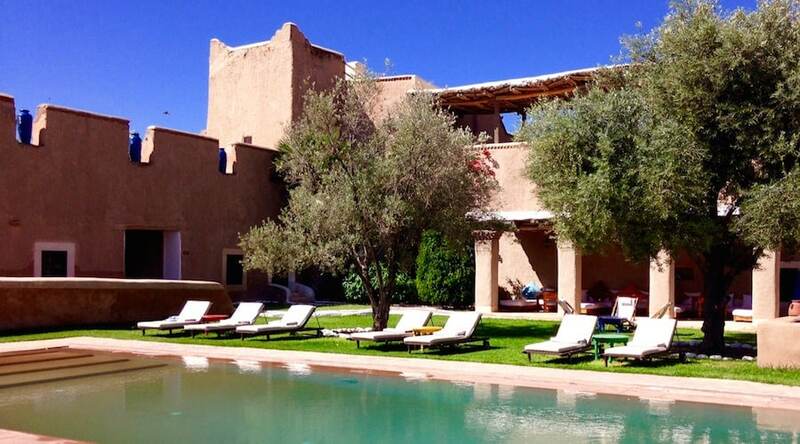 May, June and October, when Yoga Explorers run their retreats here, are fabulous months to visit Morocco, when days tend to be hot and sunny (usually around 30 degrees with blue skies) and the nights cool so it’s easy to get a restful sleep. The terrace: The large terrace where you eat is a central spot to meet and find people, top up your water bottle and hang out or use the wifi. It’s half-covered and perfect for some shade and a cool down after some time in the sun, and in the evening there’s a cosy open fire here with a low table and sofas to group around. 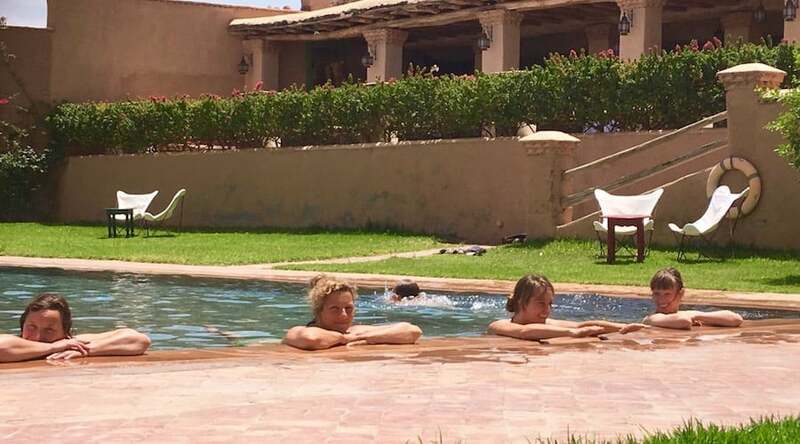 The swimming pools: There are two pools; one just in front of the terrace, which is large enough for swimming lengths, and another smaller one perfect for a cool down on the other side of the hotel. 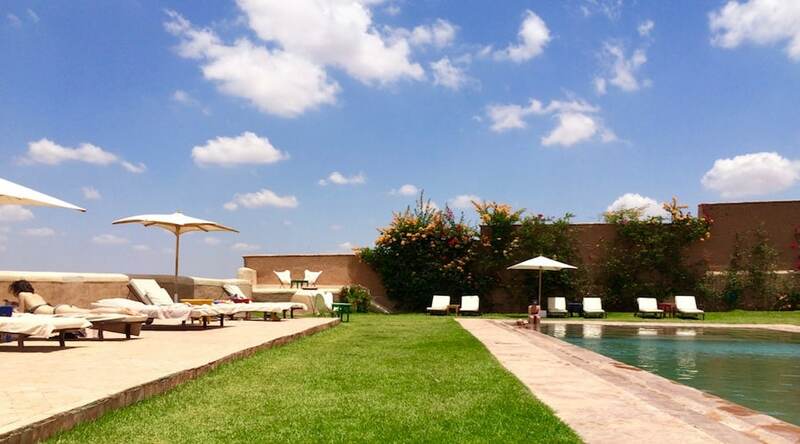 They are both surrounded by well-kept grass and the larger has a long sun deck where you’ll find loungers with lovely big pool towels and large cream-coloured canvas umbrellas. There was a sense on our visit that the larger pool was for chatting and an impromptu yoga posture demo, and the smaller pool was for reading and those who wanted some peace and quiet. We often came across a family of tortoises pottering around the larger pool. 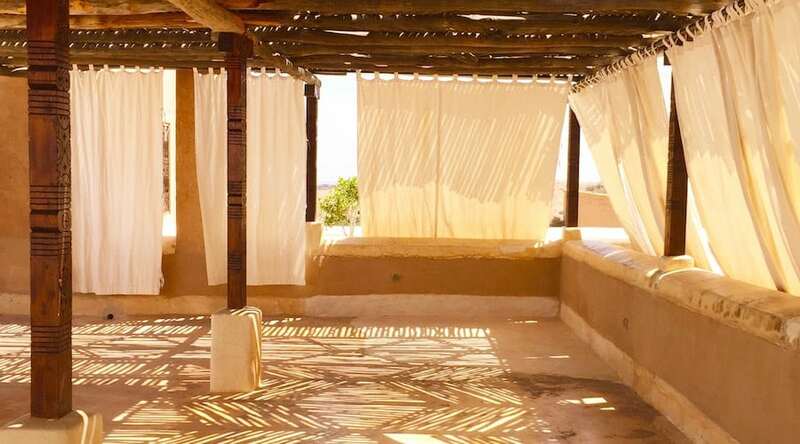 Yoga Spaces: Classes take place on the ample yoga roof terrace which has some canvas curtains and is covered by a wooden trellis to protect you from the sun, or inside in a simple indoor space. On the terrace, there are huge potted cacti dotted around, and the space is frequented by lots of little birds who chirp and fly through uninhibited. The floor up here is concrete and walls are low, so it’s not the ideal space for practicing arm balances and so on, but the indoor space lends itself well to that kind of session. This room is white and full of natural light, and has the bonus of a raised area where the teacher can demo moves clearly, but it’s only used in colder weather. The hammam and treatment rooms have a typical Moroccan decor, with tadelakt plater, wall hangings and rugs, and soft lighting throughout. There’s a coffee table of glossies in different languages and low seating if you arrive early or need to wait around with a hair mask on, and there are lockers and slippers to use. Soft music plays in the background. The two treatment rooms are simple and clean, with easy-on-the-eye art on the walls and a large curtain rather than a door, which didn’t affect privacy and allowed therapists to pop in and out with a swish rather than a more disruptive knock if they needed to consult one another. Above the large bath in the hammam is a domed ceiling and warm-coloured stained glass arched windows. 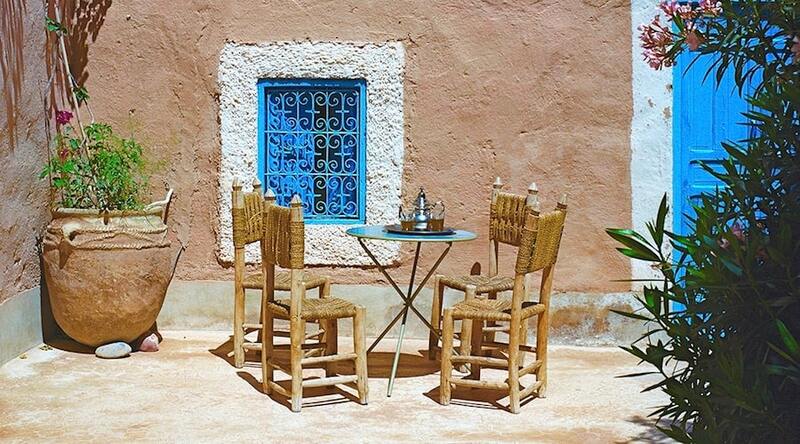 Yoga Explorers works with Hotel Tigmi to ensure the menu is healthy and satisfying, and you’ll be served mostly Moroccan-French inspired dishes freshly made with local and seasonal ingredients. There is meat, poultry and fish on the menu, but vegetarians and vegans can be catered for, along with those will allergies – just mention this when booking. Before yoga there is filter coffee, various teas and lemon slices available, and some fruit and nuts for those who need it. Then at 10am a breakfast buffet is served with a selection of fresh fruit, juicy prunes and dried figs, home-made yogurt, fabulous freshly squeezed orange juice, granola and dark bread for toasting. Sitting on a low stool is one of the kitchen team, who’ll warm up crepes or small buns for you on a gas-heated pan, or serve you a portion of a large omelette ready-made in a Tagine dish. Between 1.30-3pm there is a lunch buffet with an impressive selection of fresh leafy and chopped vegetable salads (some with protein such as tuna, egg, avocado or nuts) and with quiche or pizza and some fresh buns. 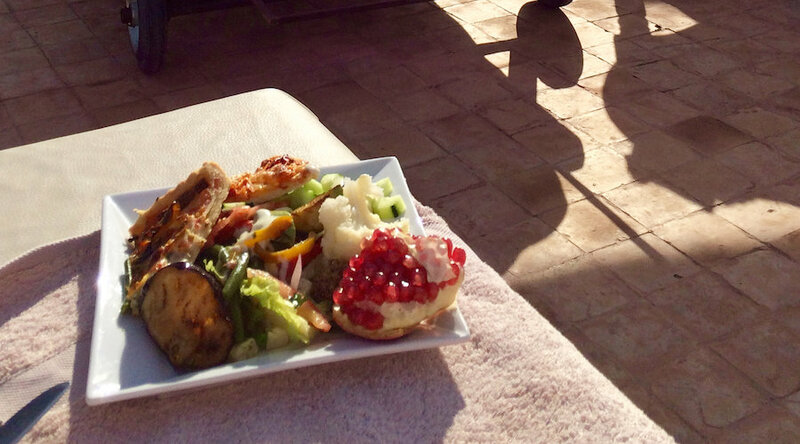 A plate of watermelon or other refreshing fruit follows, with a mint tea to send you on your way. The last meal of the day starts at 7.30pm and is either a sit down three course meal or a buffet. Tasty dips with bread may be on the table when you arrive, and starters come next. Main courses might be layered aubergine bake, baked fish, chicken or meat in a light sauce, all well presented and proportioned. Buffet nights might offer seafood paella or meatballs. Veggie options include risotto and lentil stew. Desert is usually rich, irresistible, and deserved! More mint tea, poured from on high, settles your system before bed. Espresso coffee and wine can be ordered and will be charged to your room. You can also order off the menu if you prefer and will be charged accordingly. 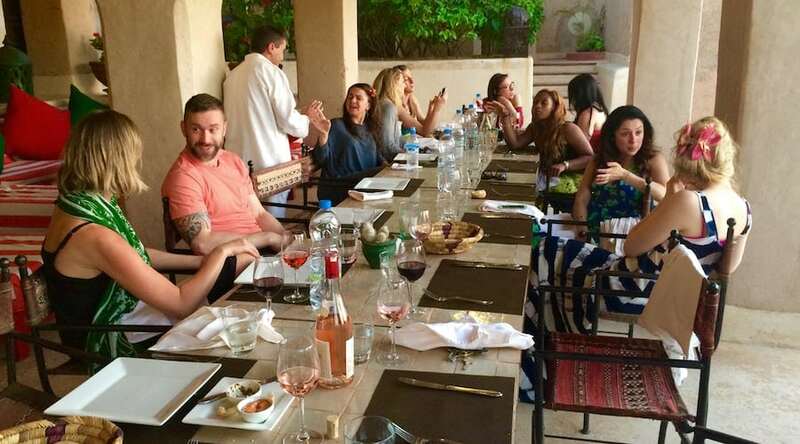 Most of the employees at Hotel Tigmi are from the local village. The owner – Julian Robbins – donates to the primary school and social association of the Mosque. Water comes from two wells, and bathrooms are heated by solar panels. 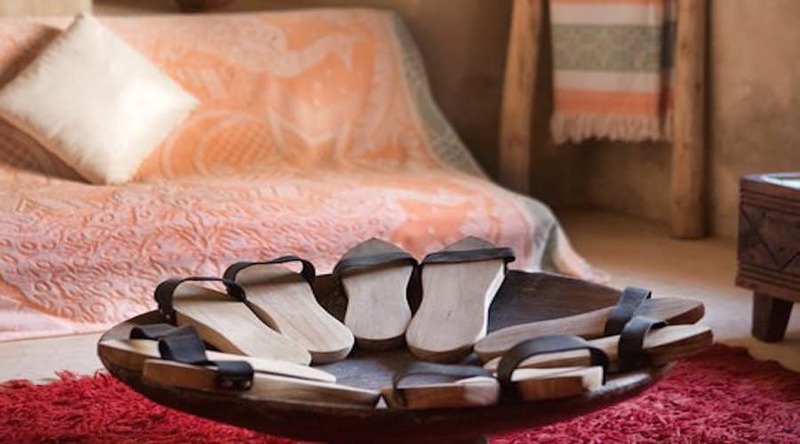 Products in the bathroom and hammam are locally made in Marrakech. Vegetables and meat are daily delivered from local producers, while fish comes from the chef’s brother, a fisherman at Oualidia (200km way on the coast). Yoga Explorers offsets carbon on all staff flights (something they also respectfully encourage their customers to do). They also support SOS Children, a charity that helps orphaned and abandoned children.